The 767 is a trusty workhorse used by airlines the world over. It comes in three types, the 200, 300 and 400 series with increasing fuselage length and increasing capacity. 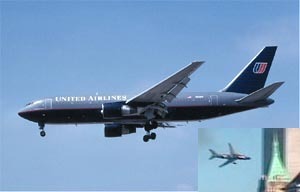 The one shown here is the very same N612UA that took off from Logan airport that fateful 11 September. Note its stubby nose, characteristic of the 200 series. 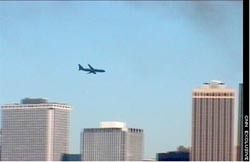 The inset shows the plane that crashed into the South Tower later that day. Somehow, to me, the fuselage seems just that little bit longer. 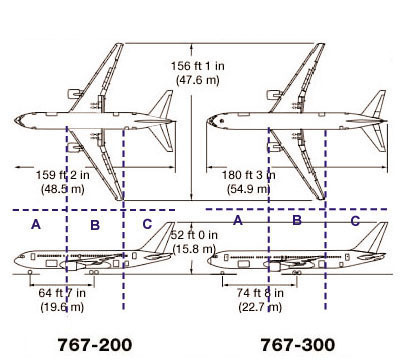 Perspective is a tricky thing, so let's have a look at the scale plans for the 767 below. Plane-spotting is a lot like bird-spotting, identification is a matter of comparing known dimensions. In this case by comparing the length of the central wing structure (B), from where the fore-wing meets the fuselage to the end of the wing tip, with overall fuselage length (A+B+C). With the 767-200 this gives us a ratio of A:B:C = 190:200:181. With the 767-300 we get a ratio of A:B:C = 221:200:217. In other words, both the fore (A) and aft sections (C) of the 200-series fuselage are shorter than the central wing section. Whereas these are longer in the 300 series. Put a ruler up to the screen and measure these yourself. Extrapolating the leading edge of the fore-wing to where it should meet the fuselage gives us the right-hand cross-hair, and the back tips of the wings the left-hand cross hair. OK, now we have a unit length B. Using the proportions of A:B:C = 190:200:181 found for the 767-200 we get the final assembly of cross-hairs. The back end of the plane is pretty close to our match, but looking at the scale plans again you'll notice that it should meet the ends of the tail-fins, not the fuselage. The front of the plane, though, is noticeably longer. There's a dark patch on the nose which may prove deceiving, but if you look carefully you'll notice that it protrudes beyond the red arrow. Therefore: This plane's fuselage is too long to be a Boeing 767-200. Um... OK. So the planes were switched. Why go to all that trouble? I must admit that I was a bit befuddled myself. Boeing has been developing some pretty snazzy flight control systems over the years. Maybe something more sophisticated than a 767-200 was required for the job. The Aviation Safety Network, Accident Description database gives quite a detailed description of all the planes that have suffered some misshap over the years. And there's our old friend N612UA, showing that it entered service in 1983. (It also shows that it was a 767-222, and not a 200ER as is sometimes mistakenly claimed. This is also borne out in the FAA registry.) Cross checking with Jane's shows that the first 767-200 was delivered on 8 September 1982. So poor old N612UA was already getting a bit long in the tooth by 11 September. Next stop Rockwell (now part of the Boeing group of companies). They produce the FCS-700 flight control system, "currently provided as standard equipment on all versions of the Boeing 757 and 767 aircraft", so maybe not going back to 1983, and N612UA, the Cinderella of the fleet, would likely be the last in line for updating. However the FCS-700 is just a fancy "fail operational autopilot flight director system", I suppose you could pre-program it but it would fly in a smooth line, not bank crazily into the South Tower as we've seen. Another cute gadget is the Flight Management Computer System, also Boeing standard equipment. The page for the 757-200 describes this as: "A fully integrated flight management computer system (FMCS) provides for automatic guidance and control of the 757-200 from immediately after takeoff to final approach and landing." And "The precision of global positioning satellite (GPS) system navigation, automated air traffic control functions, and advanced guidance and communications features are now available as part of the new Future Air Navigation System (FANS) flight management computer." Gee whiz. What does the pilot get to do then? Chat up the ladies? And they're pretty good at this "automatic guidance and control". Another nifty little piece of 50s Sci-Fi is Global Hawk by Northrop Gruman, a 737-size fully unmanned experimental plane. This baby's maiden flight was from Edwards Air Force Base, CA on 28 February 1998 [Federation of American Scientists], making it all the way to Australia on April 24, 2001, by itself [International Television News (defunct)]. 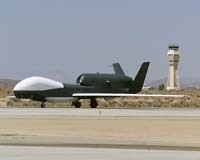 "The aircraft essentially flies itself, right from takeoff, right through to landing, and even taxiing off the runway," according to the Australian Global Hawk manager Rod Smith [International Television News (Defunct. But, Hey! This is the world-wide web. See mirror copy)]. Mind you, that's a military plane. Commercial airliners are different, aren't they? Well... can't get a date, but NASA's 'Flying Lab' ARIES, a converted Boeing 757-200, is reputed to have also taken off and landed without a pilot at the helm a few times. Apparently the skies are getting crowded and you'd get greater efficiency by having your planes radar controlled. You could also layoff a few more air-traffic controllers too. Comparing the profile of the Boeing that slammed into the South Tower with a 767-200, it seems that this was not the same plane that left Logan airport that fateful morning. It was switched. And if the plane was switched, then the "pilots" were switched too. To judge by the strange manoeuvres before it hit, the flight computers must have been tampered with. 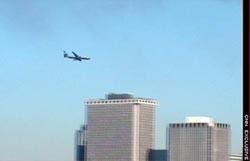 The plane banked sharply into the South Tower because it was about to miss it, even the best of pilots would have had a job hitting such a small target at 500 m.p.h.-- even an "eperienced" pilot like Mr Bush needed help landing on the USS Abraham Lincoln. Forget mucking about on a Cessna for a few hours. Autopilot and a beacon would have done the job, but then it would have gone straight in like a rudimentary guided missile. Was this more than simple tampering with the flight computers? 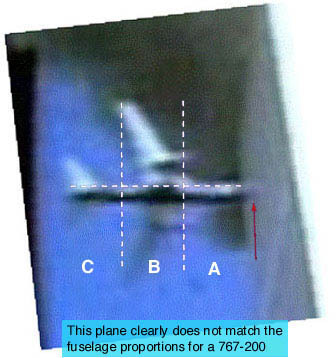 Could this "unidentified" plane have been controlled remotely from the ground? Is the "taking over of distressed aircraft and landing them" not a distant fantasy? According to Andreas von Bülow, the former German Secretary of Defence, it seems that, already back in the nineties, "a major European flag carrier" was so alarmed when it discovered that the flight control systems on its aircraft could be taken over electronically from the ground, that it "completely stripped the American flight control computers out of its entire fleet, and replaced them with a home grown version". [Tagesspiegel, Berlin, January 13th 2002]. It appears that this "major European flag carrier" was none other than Lufthansa, the German national airline. Of course, Germans are a bunch of wimps who'd only too happily lick the boots of an invading army of "Middle-Eastern gentlemen". Yet, one fine day in 2002, it just so happens that a group of military and civilian US pilots, under the chairmanship of Colonel Donn de Grand Pré, set up an independent inquiry into the events of September 11th, and came to the conclusion that "the flight crews of the four passenger airliners, involved in the September 11th tragedy, had no control over their aircraft." (...) An expert witness confirmed that "airliners could be controlled by electro-magnetic pulse or radio frequency instrumentation from command and control platforms based either in the air or at ground level." Colonel Donn de Grand Pré's inquiry concluded: "They [the pilots] had not attempted any sudden changes in flight path or nose-dive procedures - which led him to believe that they had no control over their aircraft." 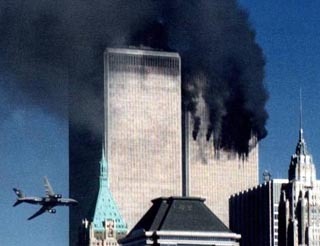 [September 11 - US Government accused. The News, Portugal's Weekend Newspaper in English, 03/08/2002 (well worth the read)]. The article also goes on to lament the lack of investigative zeal on the subject by mainstream American (and may I add British) news media. Oh, and by the way, a pilot's ingrained reaction is to "ditch the plane into a river or a field, thereby safeguarding the lives of those on the ground". 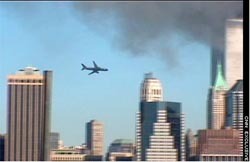 Fine ..., but do we have any conclusive visual proof that Flight 175 had been tampered with?